This book has earned a place on kitchen bookshelves the world over. It was a favorite before its publication and rose to cookbook stardom in no time following its publication in 2013. Every cookbook lover owns or at least knows about Plenty and Yotam Ottolenghi. Yotam Ottolenghi, chef, deli owner and writer, wrote this, his second book based on his popular column in The Gaurdian based on vegetarian recipes. I count Plenty among my all-time favorite cookbooks. I've only cooked a handful of recipes, but every dish I've made has been revelatory and introduced me to new techniques or new flavors (and many of those have become favorites as well). He was the first to introduce me to za'atar, cardamom, and tamarind, ingredients that have become staples in my home (Melissa Clark's Dinner calls on many of the same ingredients). I'm an enthusiastic meat eater, but the flavors here get me excited. The flavor profiles typically skew to the Mediterranean influenced by Ottolenghi's Israeli upbringing with summers spent with grandparents in Italy. Simple to make recipes these are not, you'll want to clear your counters, because you'll likely need every inch of space. This is a book for people that truly like to cook, not those that are merely looking for a simple means to getting food on the table. But the effort is well worth the reward. 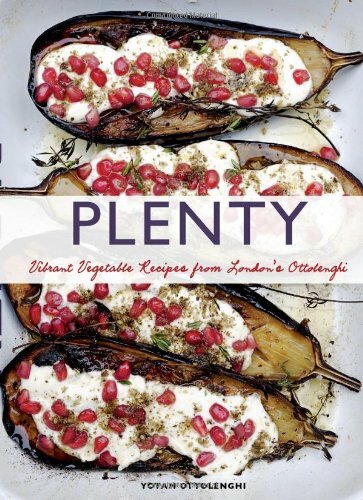 The complexity you'll get in every dish is astounding and its all because of hte layers of flavor, Ottolenghi is clearly a master at translating this to the home book. In the green pancakes I had the pancakes on their own were great, but then melt the butter and add bright notes of citrus, some sublte chili (I ended up using Aleppo chili) and ta-da, a dish with serious depth. As with all cooking, your ingredient quality matters. I've read a handful of unfavorable reviews, even for some of the same recipes I've made, and wonder if it was due to poor ingredients - I've had the same experience myself making the Eggplant with Buttermilk sauce twice - the first time I had a wonderful, almost-fresh tasting za'atar mix, the second a dried out, nearly flavorless mix from a spice jar. Big difference in end result. Compound butter is the winner in this recipe, the green pancakes are great - the earthy cumin ties the flavors together nices amid bites of green brightness, but its only after topping the pancakes with a small pat of compound butter (lime juice, lime zest, chili flake, and cilantro) that this dish gets elevated to craveable status. Yotam suggests serving this with grilled halloumi or a piece of smoked fish, I had neither so ended up poaching an egg which was a perfect topping and turns this into a refined brunch food. I recommend eating all of them fresh, I had some leftovers, which just didn't have the same amazing flavor. This dish took an eternity to make but the flavors were great, and I was introduced to cardamom ( a gorgeous, sweet, peppery, cinnamon flavor), which is now a favorite. I noted the tahini yogurt mixture was heavy on the tahini flavor and I was a bit unsure if i liked it at the time (I've read similar comments elsewhere, so maybe reduce the amount of tahini). In the end the dish came together nicely, each flavor standing on its own while complementing the others. I struggled with the flying, probably lack of practice on my end. But the oil was fully absorbed by the eggplant after only cooking half of it. I noted to skip the regular basil and either leave it out or try thai basil. But once again, the overall flavor is a winner that I'm happy to eat again. This is the recipe shown on the cover, and possibly the easiest of all the dishes in Plenty. I first made this dish all the way back in the dark ages of 2013. Apparently I was inspired by the za'atar after a middle eastern meal at The Fat Camel in New Zealand, I meal I can't recall at all today, but happy it inspired me to cook this dish. One of the things I love about this cookbook is that each dish had a takeaway, a new technique I could apply to other cooking. The way he roasts the eggplant, so easy and the result is so good - simply score the flesh, brush with (a lot) of oil, roast in the oven - perfection. Delicious and beautiful, a show-stopper. Watch Yotam Ottolenghi make this dish.